A fossil dug up in P.E.I. in 1854 has finally been identified — as the first and only dimetrodon ever found in Canada. An artist's reconstruction of Bathygnathus borealis shows where the fossil found in P.E.I. would have fit into its upper jaw. (Danielle Dufault)A fossil dug up in P.E.I. in 1854 has finally been identified. The fossil turns out to be that of a dimetrodon — the first and only one ever found in Canada, reported a team of Canadian scientists this week in the Canadian Journal of Earth Sciences. Dimetrodons are well-known huge, ancient reptiles related to modern mammals that had giant spiny "sails" on their backs. They were top predators that stalked and ate giant salamanders in the steamy, swampy forests of the early Permian period, around 290 million years ago, before the age of dinosaurs. Their fossils have previously been found in Germany and the United States. The P.E.I. 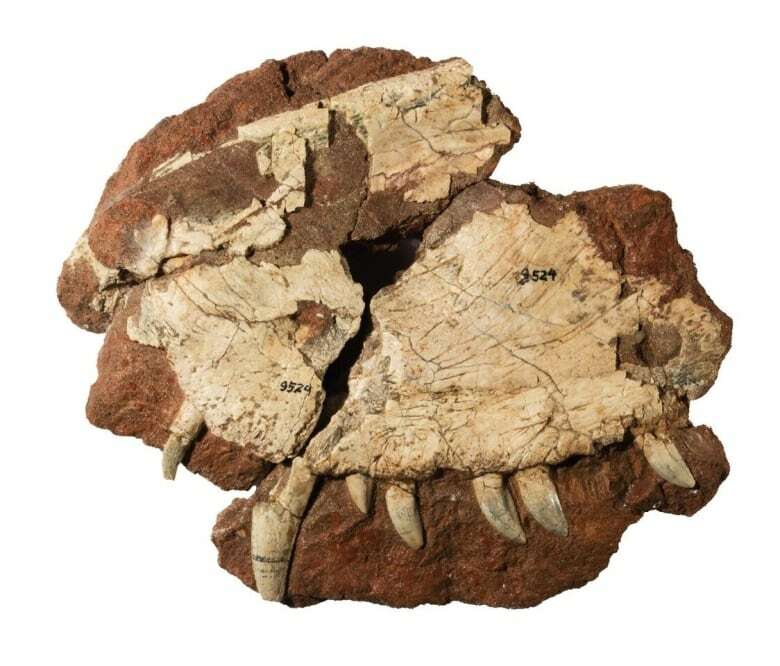 fossil — part of an upper jaw, including several sharp, curved teeth — was discovered by a farmer as he was digging a well in the French River district south of Cape Tryon, near the island's north coast, 166 years ago. Since then, it's been studied dozens of times by paleontologists who eventually agreed that it belonged to a group of reptiles related to mammals that includes dimetrodons, along with smaller relatives that didn't have sails on their backs. But it had never been positively identified. Paleontologist Kirstin Brink read about the fossil while conducting research on dimetrodons and their relatives during her Ph.D. with professor Robert Reisz at the University of Toronto (Mississauga). She had recently studied the teeth of different species and thought she might be able to identify Bathygnathus based on its teeth, she recalled in an interview with CBC News. Brink got permission to bring the specimen from Philadelphia to Toronto, where it was CT scanned at Princess Margaret Hospital. Hillary Maddin, an assistant professor of earth sciences at Carleton University, processed the images so the researchers could see the roots of the teeth and inside the teeth without damaging the fossil. 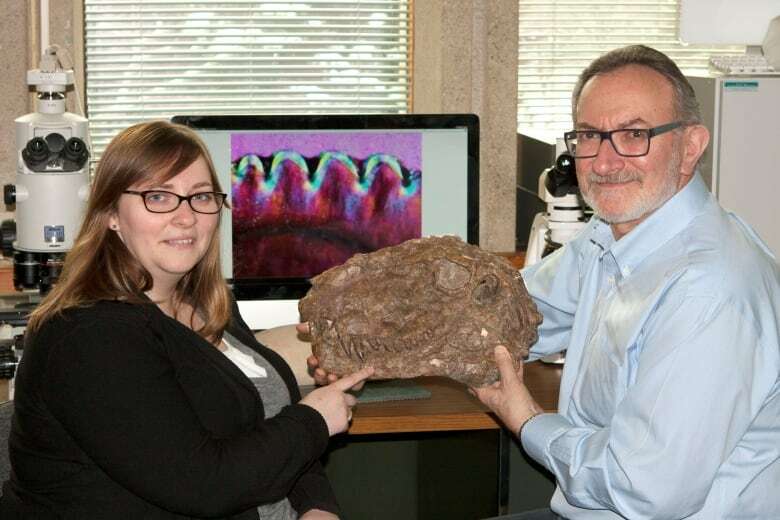 "We could definitely say that it was actually dimetrodon," Maddin said. Bathygnathus's triangular teeth had serrations on the front and back, just like those of dimetrodons from Texas. "They're like mini steak-knives," said Brink, who is now a postdoctoral researcher at the University of British Columbia.. But Bathygnathus also had an unusual bone on its face, marking it as a new species of dimetrodon — one of the largest that ever lived, at about four metres from snout to tail or nearly as long as an average-sized car. Initially, Brink was not excited to learn Bathygnathus's identity. "When I first realized that Bathynathus and dimetrodon were the same animal, I was like, 'Oh no,'" she recalled. That's because of scientific naming rules that apply when two separate groups of animals are combined into one. In that case, the older of the two names applies to both. And in this case, Bathygnathus, named by Leidy in 1853, is older than the oldest dimetrodons, which were named in the 1870s. 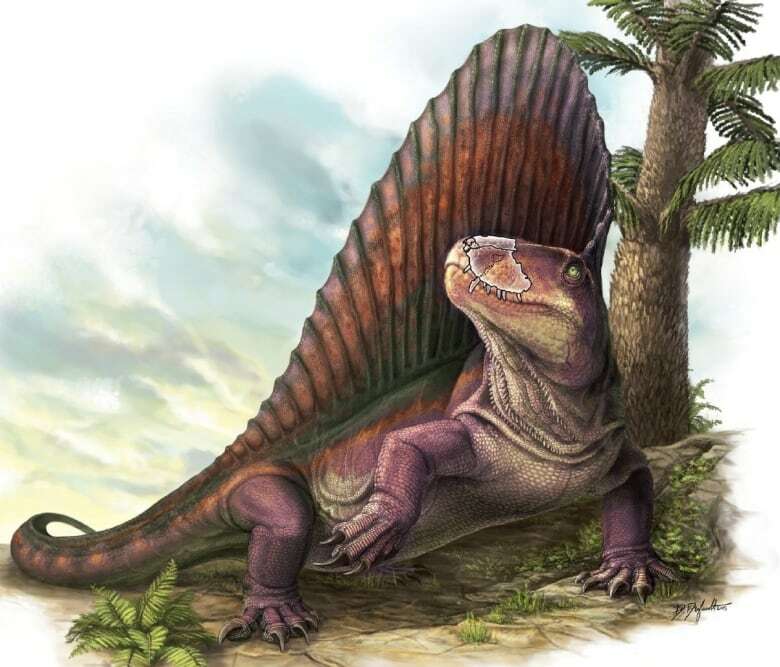 "What we're hoping will happen is the priority will be reversed so we can keep dimetrodon as a valid name," Brink said, "just because it's so well known among the public and other scientists as well." But once she got over her worry about the naming issues, though, she realized what a cool discovery it was: "We actually have a species of dimetrodon in Canada."